Cafe Melba at Goodman Arts Centre is a bespoke concept owned and operated by Tadcaster Hospitality. Located within the green compound of Goodman Arts Centre (formerly known as LaSalle College of the Arts), expect to feel removed from the hectic city with a distinctly peaceful vibe any day of the week. Our 120-seater café delivers the perennial classics like Eggs Benedict and truffle fries as well as weekend roasts and fusion dishes like our kaya tart. Enjoy a slow paced morning with friends or colleagues over gourmet coffees and luxurious teas. Boasting a spacious and family orientated design, there is plenty of space for the little ones to run free on our lawn or enjoy the bouncy castle every day (weather permitting, weekdays: 3pm-8pm, weekends/p.h. : 9am-8pm) - plus kids eat free with us on Mondays! 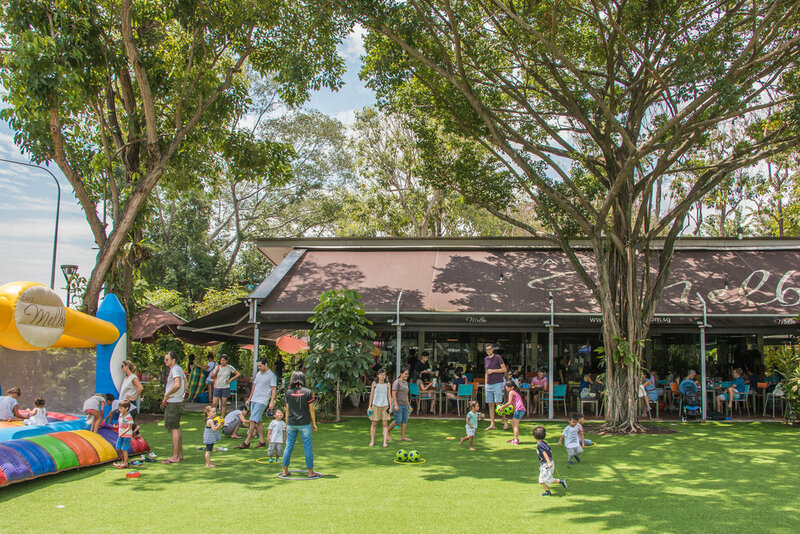 A great place to host get-togethers, kids birthday parties or weddings (in a stress-free environment! ), Cafe Melba has a dedicated events coordinator to help your event come to life with a tailored package to suit your taste and imagination. From discounts for teachers to 2 for 1 offers on drinks and pizzas, we make sure there's always a great deal.